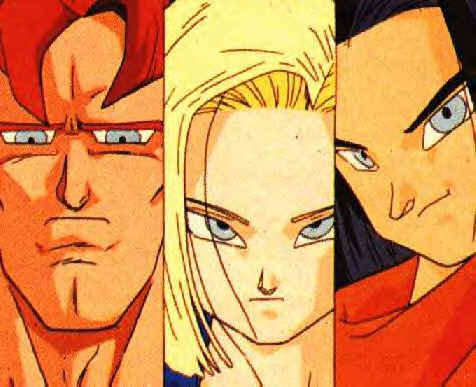 The android saga begins with Future Trunks, Gohan and Bulma living in a horrible desolate world. There are two androids, both about as powerful as a Super Saiyan. Future Trunks is about 10 or 11 and Gohan is about 17 or so. Trunks decides to have Gohan train him since androids 17 and 18 have killed all of the Z-Team and Goku died of a heart disease. Gohan wants Trunks to become a Super Saiyan at a very early age, and Trunks is very good at powering up, but he can never quite reach the Super Saiyan stage. Eventually Gohan goes to fight the androids and he is beaten but he gets away. He tries again later and Trunks wants to join in, but Gohan knocks him out for his own safety. In the fight with the androids, Gohan seems to be doing fairly well, but then both androids fight him together and Gohan gets killed. Eventually it begins to rain and trunks wakes up, he then looks for Gohan and finds him dead. He begins to cry and goes through so much anguish he goes Super Saiyan. The time jumps to later in Trunks' life and he is now about 16 - 17. He has become much stronger and wishes to fight the androids once more before he takes the time machine which Bulma has built for him. Bulma could not test the time machine because it takes 6 months to charge. Trunks fights the androids and is surprised to learn that they have a never-ending KI power. He is beaten badly. Trunks wakes up in a bed with Bulma supervising him. They say their good-byes and he takes the time machine back to the time in which the legendary Goku was still alive. The Z-teamers are all in one area, or most of the Z-team anyway. Vegeta is beginning to get along with the Earthlings a little now, and Yamcha is OK with his presence. Tienshinhan hates him though. Vegeta is still feeling enraged that Goku has the ability to become Super Saiyan, though and hates him for it. Trunks comes back from the future in the time machine. Frieza, new and improved is also coming to Earth with his father, King Cold. They land on Earth and Cyborg Frieza is anticipating his meeting with the legendary Super Saiyan, but is also scared. King Cold is unknowing of the extreme power of the Super Saiyan. Trunks arrives and sees Frieza and King Cold, they talk and insult each other ect... And Trunks eventually goes Super Saiyan and kicks the crap out of Frieza, slicing him to hell with his sword. King Cold sees this, and his son's futile attempts to defend himself, but since his pride is so high, he will not admit to himself that his son could be killed by a mere "monkey." He assumes that Trunks' sword is the reason for his success. He tricks Trunks into giving him the sword and then strikes Trunks. Trunks merely catches the blade and proceeds to kill King Cold, despite his pleas. Shortly after Trunks returns from killing Frieza and King Cold, Goku arrives in a Saiyan pod. Meanwhile, Vegeta is stunned, horrified and blazing with rage, after realizing there is yet another Saiyan who has surpassed him. Trunks almost instantly asks Goku to talk to him, and Goku agrees. They talk, Trunks tells Goku that in three years he will die of a heart disease, and two androids will destroy the world. Goku is upset, not because he is going to die (been there, done that), but because he won't get to fight the androids. Trunks then tells Goku that he has an antidote to the heart disease. Trunks processes this statement, and realizes that the legendary Goku is all that the legends made him out to be, and possibly more. While he and Goku are talking, he goes Super Saiyan. Suddenly, out of nowhere, he lunges at Goku holding his sword in front of him, much resembling the strike he hit Frieza with. This is to see if Goku is strong and fast enough to stop him. Goku simply doesn't budge. Trunks stops, inches before Goku's forehead makes contact with the sword. Goku tells Trunks he didn't move because he knew Trunks would not strike him. Trunks then tells Goku that next time, he won't stop. Trunks strikes again and again and again. Each time Goku stops the sword using two fingers. Trunks decides that Goku is possibly strong enough to defeat the androids. Trunks gives Goku a specific date and time for them all to meet, and at that time they will face the androids. Then he leaves, but not before telling Goku who his father and mother are (Bulma and Vegeta) and not to say anything that might endanger his existance (if they found out, Bulma and Vegeta might never fall in love!). Goku agrees saying "Don't worry, I don't talk much." Goku goes to the group who have been watching the whole thing, and tells everyone what happened (leaving out anything about Trunks' parents) but forgets the date to meet. Fortunately, Piccolo, with his Super-Namek-Auditory-System overheard the whole thing and tells everyone the date, but mentions nothing about Trunks himself. They all go their separate ways, in order to train as hard as they can for the next three years. Goku, Gohan and Piccolo go to train, Tienshinhan and Chautzu go off with each other, and Krillin and Yamcha each go their separate ways. The Z-Warriors are surprised to find Bulma there holding a baby (Trunks) in her hands. Goku mistakenly calls him Trunks before Bulma gives him the name, but since Trunks has already been born, there is no danger in revealing who he is. Since the Z-warriors cannot sense the KI of an android, they must look for the androids with their eyes and ears, and that may take a while. Eventually, Yamcha finds the androids, and is surprised to see what they look like, since no one ever got a description from Future Trunks. The androids quickly absorb Yamcha's energy through red orbs in their hands then promptly punch a gaping hole through Yamcha's stomach. The other Z-fighters eventually find Yamcha and fight a little with the androids, but soon give up, realizing that the fight is causing too many casualties. Yamcha is taking back to the original meeting place on the island (on a hill) and given a senzu bean, which revives him. The androids and the Z-fighters all go to an island. Surprising, Goku is winded just from flying. Something is noticeably wrong with him. He begins to fight with android #19 and is whooping him up, but seems to be in worse and worse shape. Eventually the android overpowers him, and begins to absorb his energy. Piccolo is about to rescue him, when Vegeta rams into android #19 with a flying kick. The Z-warriors realize that the reason Goku is in such bad shape is because his heart condition is hurting him. As it turns out, he has never taken his medicine, because the symptoms never came. Yamcha takes him back to his house, where he is given the medicine. However, it seems to have little effect. Meanwhile, back at the island, Vegeta has a few surprises of his own. Unbeknownst to the Z-fighters, Vegeta has acquired the ability to go Super Saiyan. He explains how ironic it was that his very anger at not being able to go Super Saiyan was the thing that caused him to go.. Vegeta and Android 19 fight around a bit, and it becomes clear that Vegeta has the upper hand. Eventually, Vegeta lets the android grab onto his arms, the Andriod begins to drain his energy saying "I'll never let go!" Vegeta asks "Never?" He places his feet on the android's chest and pulls its arms from their sockets. Vegeta then proceeds to destroy android 19. Meanwhile, #20 is astonished that there can possibly be anybody this strong. He flees into a giant mountain, using the cracks to conceal himself, since the Z-fighters cannot sense his Ki. Vegeta is given Senzu and follows the android. The rest of the Z-fighters follow Vegeta. Android 20 is contemplating what to do. He decides to pick off the Z-fighters and steal their energy, then move on to Vegeta. He tries to steal Piccolo's energy, but since Piccolo has a supreme auditory system, he knows the attack was coming. Unbeknownst the android, Piccolo was actually destroying his energy while he thought he was absorbing it. Piccolo then takes a senzu and challenges #20 to a bout. 20 agrees, assuming he should be at least as strong as Piccolo after absorbing his energy. He gets the crap kicked out of him. He flees into the cracks of the mountain again and is going back to the lab. Once Gero returns to the lab and attempts to persuade #17 and #18 to fight the Z teamers. The androids disagree, and don't like being commanded, and say so. The two androids decide to activate #16 despite many warnings from Dr. Gero. #17 and #18 kill Dr Gero. Vegeta states that that's not unusual, and that it is perfectly normal to kill anyone you don't like. Trunks shoots a blast into the cave which the lab is in, but it has no effect, #16 is activated. They ask him if he was made to kill Goku, and he replies to the affirmative. #18 says it makes her sick to think of Dr. Gero's goals for them. The androids fly away, and the Z teamers realize they are heading towards Goku's house. Vegeta is mad the androids paid him no notice, and insists on following them despite numerous warnings from Trunks. Meanwhile the androids decide to touch down for a while. In a debate about taking a car, #17 asks #16 if he was made from a man like they were. #16 calmly states that he was made from nothing. The androids are puzzled over this for a little while, then Vegeta confronts them. #18 tells #16 to fight Vegeta, but he refuses. #18 and Vegeta begin to duel, and #17 is surprised that the Saiyan is much stronger than Dr. Gero told them he was. All of the Z teamers return, and Vegeta comments on how stupid they are. #16 refuses to fight again. Trunks tells Vegeta to run, and the androids say they won't fight people who run away because they have no interest in them. Vegeta asks Trunks if he could use another slap. #17 complements Vegeta's fighting skills, but Vegeta just insults him in return. Piccolo notices that the android has infinite stamina, and Vegeta is getting weaker by the minute. Vegeta never stood a total chance against #18 and she teaches him that as she kicks him in the arm... breaking it. Trunks yells out and rushes at #18. #17 had said earlier that if anyone else jumped in, he'd be forced to come in. Trunks goes super saiyaan and pulls his sword out on #18. But 18 only blocks Trunks's sword, chipping his sword. #17 and 18 make a total fool out of Vegeta, Piccolo, Tien, and Trunks. Krillin is frightened and stands there. After the androids have taken care of the other warriors, they walk to Krillin. #17's plan is to find Goku, but he wants to make sport of it so doesn't force Krillin to tell him. #18 kisses Krillin on the cheek and tells him good luck. Krillin is frightened and tries to talk the androids out of their so called 'game'. Their game plan is to destroy Goku. But the androids tell him they will not back down and leave Krillin. Krillin gives senzu' beans to the other downed warriors.